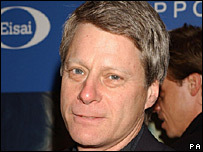 TV presenter Nick Ross has announced he is leaving the BBC One programme Crimewatch after 23 years to pursue other projects. His last programme will be next month. It will include a look back at his contribution to the programme. Ross said: "We have created something of a national institution which continues to be a phenomenal success in solving crime." One in five cases featured on the programme is solved, the BBC said. BBC One controller Peter Fincham said: "It's no exaggeration to say that, without Nick, there would have been no Crimewatch. "We wish him well for the future and I am hoping that he will be back on BBC One soon." Ross said he would "greatly miss" the show and added he thought it had helped solve "dozens of murders". The presenter said he had no "bad memories" apart from the murder of his fellow presenter Jill Dando, who was shot dead in 1999. "I shall continue to do all I can to support the Jill Dando Institute at University College London which, with huge public support, we created in her memory," he said. "I am grateful for the enormous warmth and loyalty of Crimewatch viewers," he added. BBC commissioning editor for factual features Ben Gale said he remained "committed to the long term future of Crimewatch" but added "every long-running strand needs to be regularly refreshed". Fiona Bruce will continue to present the programme.